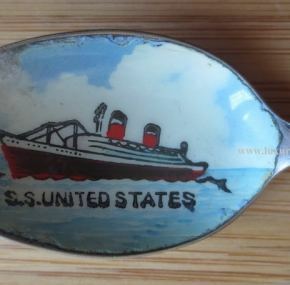 Many tens of thousands of passengers sailed on the United States during her career. Her popularity was never in doubt, and even in her last year she averaged nearly 70% occupancy rates. The 1953 annual USL report to shareholders is before me as I write this. It states somewhat drolly: “Passenger operations during the year 1953 were most satisfactory, highlighted by the superb performance and the excellent carryings of the United States the world’s fastest and most modern liner….” During the ship’s first full year of service, she carried 70,589 people which was an average of 3,069 per round trip. That means she was nearly full on every crossing. Quite a feat! 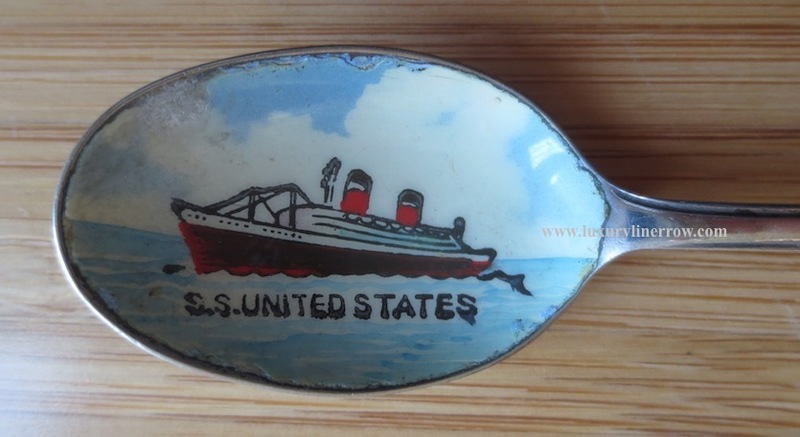 Here is a beautiful silver plated souvenir spoon with the ship painted in the bowl. In excellent condition with some chipping around the edge, which is not that noticeable. 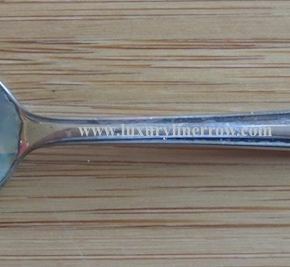 Measures about 3½” long.